ENGINEERING UNCERTAINTY AND RISK ANALYSIS, Second Edition. A Balanced Approach to Probability, Statistics, Stochastic Modeling, and Stochastic Differential Equations. 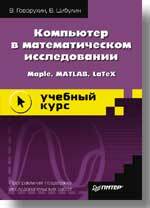 Govorukhin V., Tsybulin V. Computer for mathematical study: Maple, MATLAB®, LaTeX.